I mentioned in my last post about my Frames of the Month, I sat down and wrote out what I want each month to be about; for June I thought summer - so I set out to find the perfect background paper, I knew I'd be quilling a sun for it but didn't really know what else I wanted to include - I needed another element or two to even it out; I finally decided on flip flop's. I searched through my papers, way too many papers; and found this new one I bought recently called 72 and Sunny - something like that - absolutely love these papers and bought way too many of them. I thought originally I would do something solid or a tone on tone dot like last months, but instead I chose this super summery stripe pattern - LOVE it! I covered the mini frame with this paper, added a quilled sun in the top corner and a cute quilled pair of teal flip flops for the bottom - they even have a little glitter bling on them (if you look closely). I actually made myself this frame for my desk at work - I rarely do that, but I really liked the way it turned out - I'm going to put a picture of my two rascals from last weekends slip-n-slide escapade, they had so much fun. 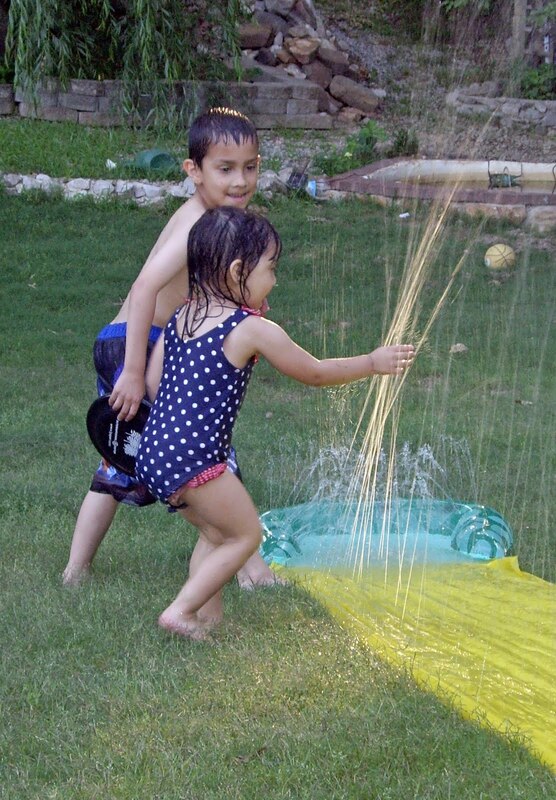 My rascals and their slip-n-slide, so much fun. Too cute! And absolutely perfect for that picture! Love it. Oh, those flip flops are SO sweet! Wishing you a good weekend!